The Appalachian Trail Conservancy’s mission is to preserve and manage the Appalachian Trail — ensuring that its vast natural beauty and priceless cultural heritage can be shared and enjoyed today, tomorrow, and for centuries to come. 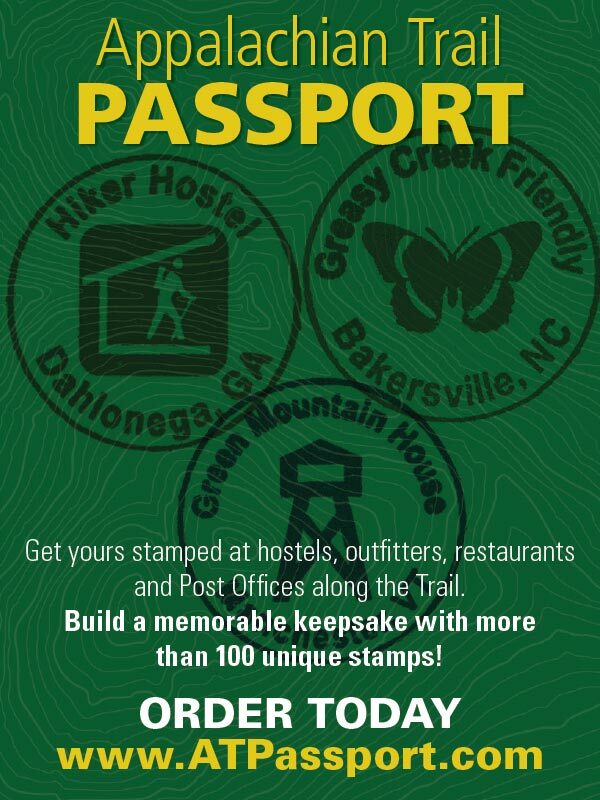 © 2019 Appalachian Trail Conservancy. All rights reserved. Observations, conclusions, opinions, and product endorsements expressed in A.T. Journeys are those of the authors and do not necessarily reflect those of members of the board or staff of the Appalachian Trail Conservancy. A.T. Journeys is published on Somerset matte paper manufactured by Sappi North America mills and distributors that follow responsible forestry practices. It is printed with Soy Seal certified ink in the U.S.A. by Sheridan NH in Hanover, New Hampshire. A.T. Journeys (ISSN 1556-2751) is published quarterly for $15 a year by the Appalachian Trail Conservancy, 799 Washington Street, Harpers Ferry, WV 25425, (304) 535-6331. Bulk-rate postage paid at Harpers Ferry, West Virginia, and other offices. Postmaster: Send change-of-address Form 3575 to A.T. Journeys, P.O. Box 807, Harpers Ferry, WV 25425. IN MY 11 YEARS AS EDITOR, I HAVE HAD THE PRIVILEGE to work with countless, talented contributors — not to mention our graphic designer Traci Anfuso-Young, without whom I would only be one half of a dynamic duo. These writers, photographers, and artists pour their passion for the A.T. into their work. So, I am thrilled that we are taking some big strides with a fresh new design, starting with this issue, to bring you the voices and images that tell the extraordinary story of the Trail as a part of the “Wild East” — from the birds that soar above to the mountains and forests on the ground. CHEERS TO A NEW YEAR, fresh thinking, and finding your wild place. The Appalachian Trail Conservancy (ATC) is off to a great start this year in thinking creatively, with an eye on the future. We’re launching “Wild East,” a powerful public outreach initiative intended to increase support for the Trail and the lands that surround it. You, and hopefully millions of other people, are going to hear us talk about how the Appalachian Trail is the heart of an important corridor of open space in the eastern United States — open space that astonishingly remains intact, stretching nearly 2,200 miles, open space that needs attention and your support. Just as the West has its allure of scenic vistas, starry skies, and towns of character, so does the Trail and its adjoining lands. The ATC is going to be talking about how the Wild East is every bit as important as the iconic, well-known national parks in the West. And how we now, urgently, need to make certain the future of the Trail is expansive, not limited. The Appalachian Trail is the centerpiece of the “Wild East” — its backbone and its heart. Its wildness is tangible and close. The Trail is the largest natural corridor that remains east of the Mississippi River, within a day’s drive from 55 percent of the U.S. population. Offering scenic and bucolic open space near many major population centers, the A.T. is surprisingly accessible to both thru-hikers and day hikers, to solo travelers and to families and groups. For the three million people who set foot on the Trail each year, it is a place for connection and community, yet a haven for solitude and silence, too. Guided by the Trail’s famous white blazes, A.T. hikers tend to discover something essential and profound — the exhilaration of freedom, an appreciation for beauty, and a sense of their own power. The north-south corridor of the Tail, traversing the highest and lowest elevations of the ancient Appalachian Mountains, anchors the headwaters of critical watersheds that sustain more than 10 percent of the population of the United States. The Appalachian Trail Conservancy (ATC) announces that the A.T. Tribute Garden — located at ATC’s headquarters in Harpers Ferry, West Virginia — is complete. Thanks to the generosity of more than 600 donors who purchased engraved bricks, boulders, benches, and other items, the ATC created a lovely and peaceful place that celebrates and remembers those who have walked the Appalachian Trail, helped protect it, and have been inspired by the longest, continuous footpath in the world. The Appalachian Trail Community lost a long-time supporter and trusted friend last October. Known to many of us from Georgia to Maine and beyond, Bob Proudman passed away while with his family on October 18 after a brief and courageous struggle with cancer. Find out what’s happening on Capitol Hill — and how it will affect the Trail. A three-year relocation of the Trail in central Virginia was just completed at the end of 2018, replacing a steep and slippery scramble with a gently-graded switchback. The final half-mile of the northbound ascent of Sinking Creek Mountain was identified as a problem over a decade ago, since steep alignment made the Trail hazardous in wet conditions. But finding a new route was complicated by a relatively narrow corridor of national forest land and an abundance of rock fields. The new switchback fits just within the corridor, and features over 200 rock steps and many large stone crib walls built to last for generations. An observant hiker can enjoy a challenging but more enjoyable climb, as well as the beauty of the durable, technical stone structures. More than 100 volunteers from the Appalachian Trail Conservancy’s (ATC) Konnarock Trail Crew and the Roanoke A.T. Club contributed almost 4,000 hours to complete the relocation. Volunteers from the nearby Natural Bridge A.T. Club and the Outdoor Club at Virginia Tech pitched in too, especially for the final “Special Forces” push to open the new section in December. Relocations like this are integral to the ever-evolving A.T. The fluting notes of a wood thrush serenade your one-pot dinner. A barred owl hoots “who cooks for you” in the night. A loon’s wail coils around your heart on a Maine lake. Wherever you are on the Appalachian Trail, birds offer sweet companionship. Yet, as hiker numbers soar, bird populations tumble. More than half of North America species are experiencing major declines. We have a few billion less birds than 40 years ago. In one drastic example, the golden-winged warbler nests in multiple places along the A.T., including the Roan Highlands, where its numbers have plummeted by a staggering 98 percent. Within this sobering news, the A.T. shines with the promise of protection and ecological restoration. For instance, the Appalachian Trail Conservancy’s (ATC) habitat work on behalf of the golden-winged warbler is leading to an uptick in nesting birds, while serving hikers with more expansive views. The ATC also partners with other groups to conserve the warbler’s critical winter home in Columbia and Venezuela. This work across international boundaries will help to ensure the survival of this species. Chloë works for the Appalachian Trail Conservancy (ATC) and needed to hit the Trail to scout a route for a “How to Hike the A.T.” backpacking course she’d be leading that spring, but I had my own motivations for joining her. I had just found out that I would be moving to Colorado in three weeks. While I was excited for all the skiing I would soon be doing, I knew that my hiking boots would get tucked away in a corner of my closet for the next few months. The mountains of western North Carolina had been my home for almost four years, and I couldn’t think of a better way to say goodbye for now than to spend a weekend exploring a new section of that familiar white-blazed Trail. So what if it was January? An award-winning film that describes a journey into the Smoky Mountains during a week-long snow storm — and the struggles, rewards, and determination to endure. Chris Gallaway — writer, photographer, and filmmaker — chronicles his winter hike in a full-length documentary about the Appalachian Trail, The Long Start to the Journey. A heartwarming clip from Chris’ winter film can be found at: appalachiantrail.org/thelongstart. Chris has also produced a beautiful and calming short video for the ATC featuring winter hiking and spring thaw. Visit: appalachiantrail.org/winterontheat, and immerse yourself in the virtual experience of winter on the Trail. Chris and his wife, “Sunshine,” live in Black Mountain, North Carolina with their young son and infant daughter. Chris’ award-winning production company, Horizonline Pictures, produced ATC’s exceptional myATstory video series which can be viewed at: myATstory.org. WINTER IS A GREAT TIME TO SNUGGLE IN WITH A GOOD book until the weather warms. Tod Jones, an avid A.T. section hiker and reader, recommends four Trail memoirs that are certain to inspire. Jones taught English composition and literature for 20 years at the University of Maryland College Park. He turned to reading Trail memoirs four years ago when he and his wife, Karen, started hiking the A.T. Since then, they have logged 930 miles. Jones says reading memoirs has been inspiring and informative. He underscores the point that hiking the A.T is, without question, a very personal experience that is uniquely shared in each book. (Picea rubens) once thrived in the southern Appalachian’s iconic areas of Clingmans Dome, Mount Rogers, and Roan Mountain. These forests are now considered a critically endangered ecosystem. Red spruce were heavily logged between 1905 and 1930, followed by wildfires, further drying the soils making conditions poor for germination. Hardwood species had the advantage (birch, cherry, maple) choking out spruce seedlings. CONTEMPLATING THE POWER OF TRANSFORMATION THROUGH MIGRATION IN LIFE AND NATURE. RECENTLY, I READ A NOVEL THAT centers around migratory issues of the monarch butterfly. It reminded me of when I first became aware of the monarch’s migration. At the time, I lived on a narrow barrier island, and I recall being surprised to see a monarch butterfly so close to the Atlantic Ocean. It was miraculous to see such a fragile winged thing of beauty gain any distance in the steady ocean breeze. The fact that we were literally located on the eastern side of the United States and these dainty butterflies were planning a flight route southwest over 2,000 miles astounded me. Come to think of it, it was late autumn, and I remember being concerned that the monarchs would never reach Mexico by the first frost. It seemed an impossible task and I wondered why they had flown so far from home. NOT FAR FROM THE BUSTLE AND BUZZ OF WASHINGTON, D.C., the pastoral town of Round Hill, Virginia is a refreshing destination, offering an escape from the daily grind. TIP: Grab your camera or smartphone for remarkable and shareable photos of the sunset from Bears Den Rocks. Linger in the fading light. And make certain you have a headlamp or headlight to find your way back. Located in western Loudoun County — in the northwest tip of Virginia, and not to be confused with other towns in Virginia of the same name — Round Hill recently joined an impressive list of nearly 50 other cities and towns to become an official A.T. Community, recognizing the Trail as a community asset and pledging to support ongoing stewardship. AS 2019 BEGINS, I AM CONTEMPLATING HOW LAST year flew by so fast that I did not get a chance to get out and enjoy the Trail as much as I had hoped. But the Trail beckons my husband and I to repaint fresh, new white blazes along the three-mile section we maintain. These simple footpath duties will be our reminder that the A.T. is there waiting for us to care for it and coax us to trek past our section and enjoy more. I am reminded how multi-faceted managing the entire Trail is — as an ever-changing and shifting, living organism with so many passionate people involved. We put our heads together and determinedly face big challenges that keep us on our toes (so that so many others can slip some boots over their toes and enjoy it). Thanks for reading this issue!